Except for a 'Best of' collection in 2008, we haven't heard from Germany's Mind Odyssey in 10 years. With one listen to 'Time To Change It' you'll realize that it has been far too long for something new from this talented bunch. Mind Odyssey has always been a vibrant source of progressive rock and metal. This disc ups the ante significantly as it contains a varied collection of arrangements. These compositions are so eclectic to be mind bending and sonically challenging. In other words, 'Time To Change It' is a most satisfying platter of progressive rock. Immediately, 'Riding And Ruling' enthralls with a massive dose of driving melodic hard rock. This theme returns on the brilliant 'Higher Ground' with it's heavier riffs, steady pace, and tag team keyboard and guitar solos, and the wildly fun 'Raven and Swan' which moves briskly toa psychedelic fret shredding finish. Purist will love the tricky progressive numbers with the funky groove including 'Enemy Daggers' with it's smashing vocal arrangement, and the totally unique and wholly satisfying 'Storm Warning' with more tandem solo work between keyboards and guitar. For something more raw, with a metal tinge yet still immensely melodic and catchy, try 'I Want It All.' For a straight forward melodic metal ballad, finish with the thrilling 'Under The Moonlight.' 'Time To Change It' keeps you moving and guessing. 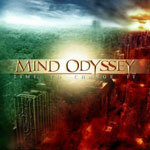 Mind Odyssey's 'Time To Change It' is a smorgasbord of tasty progressive rock delights. It's a whirlwind tour through ingenious musical country that will keep you interested, intrigued and guessing as you travel. Awesome stuff!